Signatures in Front are associated with users. Your signature(s) will follow you from channel to channel (both individual and team), as you reply to messages you're working on. Go into your Settings and select My signatures. Click Add a signature to create a new signature, or select a signature from your list that you'd like to edit. The first field is where you set the Name of your signature. The name will not appear anywhere on the recipient's end. The next field is the Sender Info. 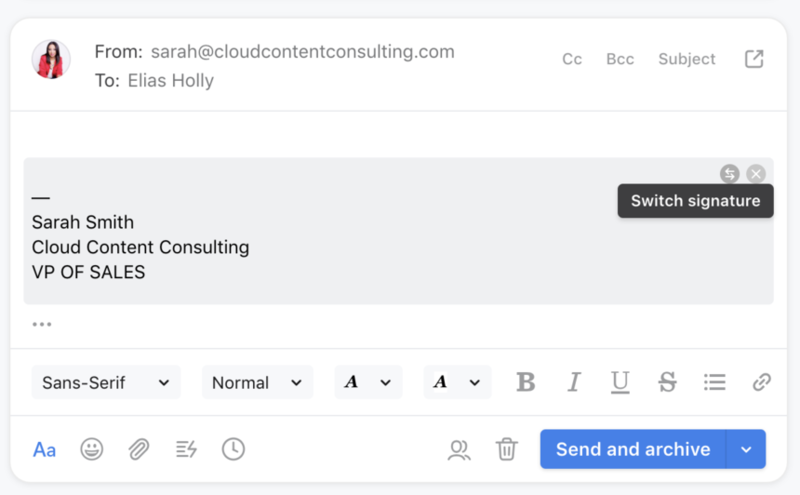 This is where you set what will appear in the header of emails you send. Finally, the large text box is for the signature itself. If you want to include an image, you can click Add image at the bottom. Click Save. If you turn the toggle off, use the checkboxes to choose which channel(s) you want this signature to appear in. You can switch between signatures while you're composing a message. Click the arrows to the right of your signature and a dropdown of your options will appear. How do you set up signature to only appear on FIRST REPLY emails? Currently there's no way to do that. I would like to create a signature which includes an image as a hyperlink (a LinkedIn logo which takes you through to a my company LinkedIn page). It seems I can have a hyperlink or a logo but not both combined? 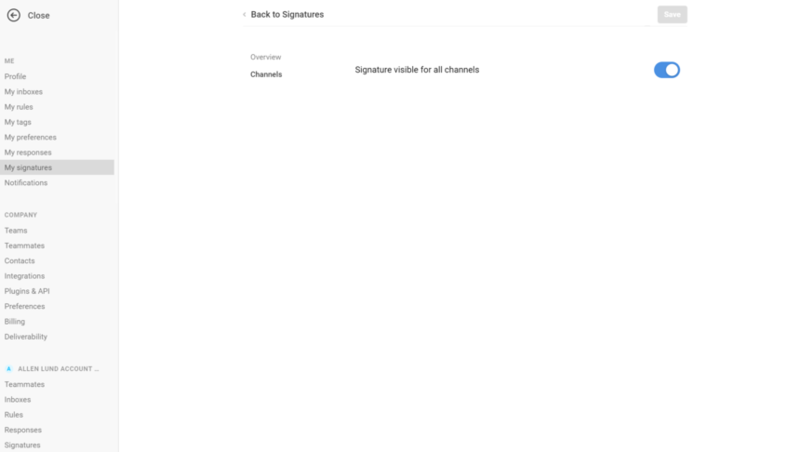 How can you (if possible) sync the signatures set up in gmail account to that account's signature in Front app? Or do you have to copy and paste the signature for every account? Jimmy Bliss Hi there! Sorry for the delayed reply. Yes, you'll have to copy/paste each one. Currently there's no signature sync. Sorry! Hi Cori - Is there a way to default to no signature and then add it only when I want it? 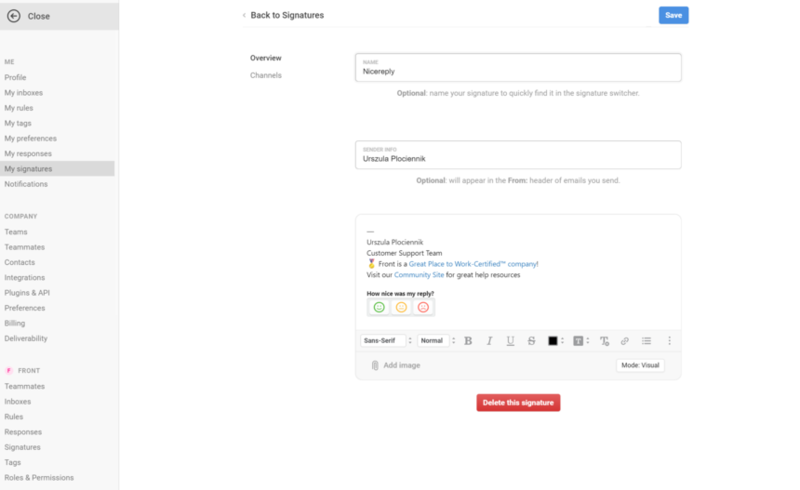 And/or, have you added the ability to default to no signature for replies? Brad Nihls There's no way to default to no signature. What you can do, though, is default to a blank signature, that's just a blank line, and then change that if you wish to. Hi Cori, is it possible to set up signatures for a specific mailbox? 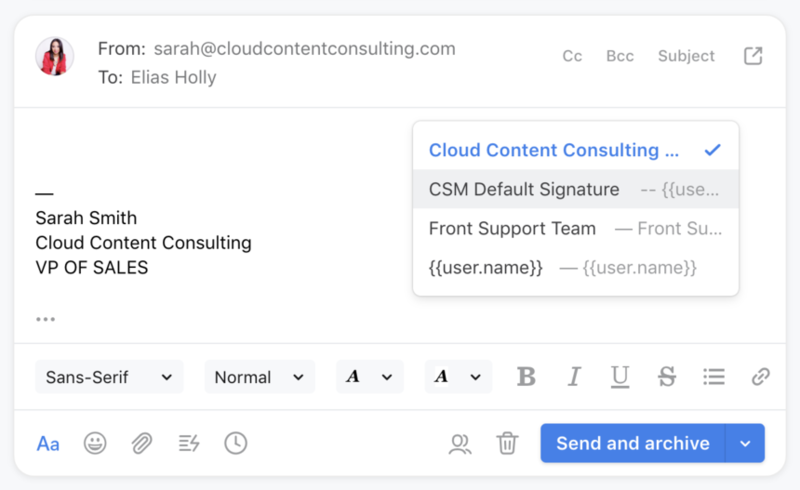 For instance, we have a shared inbox for support- can the signature be set to our Support Signature and shared by everyone? Right now it looks like I set it up and it is only visible to me. 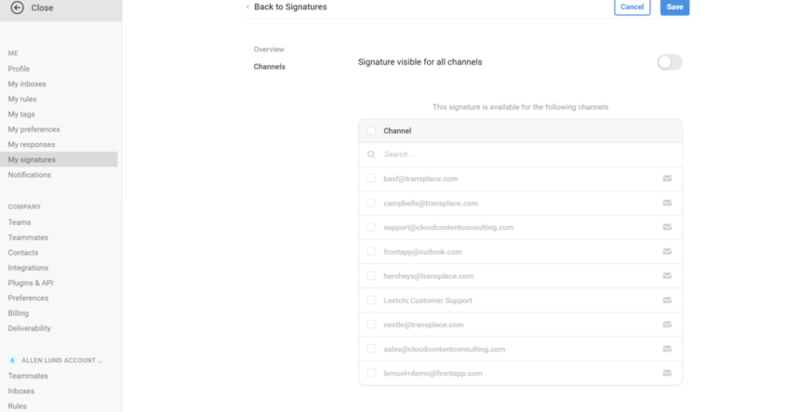 Hi Lexi Neste , in Step 5 you can see how to make the signature visible to certain channels. If you've created a personal signature, however, you won't be able to share that, so make sure you've created a team sighature. Helena Li Great! I assumed as much as the tab was listed "my signatures". The problem is that I do not have a team signature option, only Responses and Tags. How do I get the team signatures option? Hi, I'd like to know if the signature sync is working with gmail now ? Thank you !